The finest tea collection. 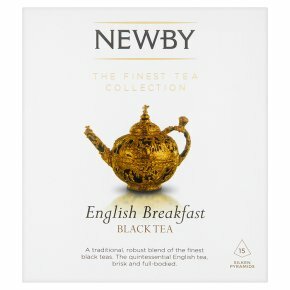 Suitable for vegetarians.A traditional, robust blend of the finest black teas. The quintessential English tea, brisk and full-bodied. Tasting Notes A rich amber cup that is brisk and full-bodied, followed by a prolonged, spicy and malty aftertaste. The Silken Pyramid This precious whole leaf tea is cocooned in biodegradable silken pyramids, individually sealed for freshness. The Perfect Cup Place one silken pyramid into freshly, fully boiled water. Brew for 3-5 minutes.